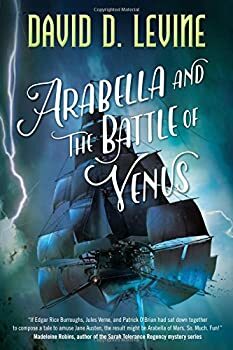 The adventures of the gallant-hearted young heroine Arabella Ashby continue in Arabella and the Battle of Venus (2017), David D. Levine’s warm-hearted melding of retro science fiction, à la Jules Verne, and the Napoleonic wars. 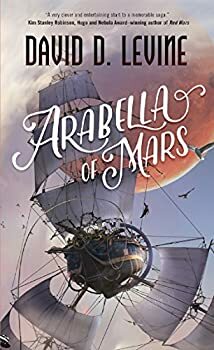 In this sequel to Arabella of Mars, Arabella receives a battered letter from fiancé Captain Singh, regretfully informing her that he and his ship, the Diana, along with all his crew, have been captured by the French and are being held as prisoners of war on Venus. Though Captain Singh insists in his letter that Arabella remain on Mars, Arabella is not one to accept a bad situation without trying to do something to help … especially once her investigation reveals that Napoleon’s cruel and bloodthirsty minister of police, Fouché, is heading to Venus and will be the chief gaoler over Captain Singh and his men. So Arabella gathers all the funds she can and leaves her Mars plantation to go to Venus. Accompanying her, at the insistence of her brother, is a chaperone, the widowed Lady Corey, who tries with limited success to instill more ladylike behavior in Arabella. They fly to Venus on the ship Touchstone, captained by the attractive Captain Fox, whose flattering attentions to Arabella might just give her second thoughts about her plans to marry Captain Singh. Unfortunately, once the Touchstone gets close to Venus, Arabella’s heroic plans run into some major roadblocks. Now she has to deal with French captors, their Venusian servants and slaves, and a prison camp where life is brutally harsh and dangerous. At least she’s in the company of Captain Singh ― but his behavior, though distantly affectionate, is oddly elusive and secretive. When Napoleon Bonaparte himself shows up with his wife Marie Louise, everything Arabella and the other British prisoners are trying to accomplish is threatened. Arabella and the Battle of Venus is, like Arabella of Mars, a cleverly conceived and executed novel. Levine spins a story incorporating elements from both early science fiction and actual history, weaving in real people from the Napoleonic era. It’s not only major players like Napoleon and Admiral Lord Nelson, but also less well known historical figures like British Vice Admiral Cuthbert Collingwood, the American inventor Robert Fulton (who did spend some years in France, designing steamboat engines, submarines, and torpedoes), and the merciless police minister Joseph Fouché. Sailing ships ― with a few tweaks ― function as spaceships in this universe. Arabella and the Battle of Venus is, at the same time, a grimmer story than Arabella of Mars. While the element of nautical adventures in space still plays a role in this tale, a large chunk of the story takes place in a muggy, gloomy French prison camp on the surface of Venus, where death and permanent injury are a constant threat, and prisoners of war are routinely treated inhumanely by their captors. It’s a claustrophobic time, lightened only by the element of intrigue. It’s a distinct breath of fresh air when the action finally returns to space. The green-skinned Venusian aboriginal natives are derogatively called “froggies” by many characters, echoing the slur the British used for the French themselves. But the Venusians’ more important role is to put a face on the problem of slavery. The problem is not just the French enslaving the Venusians, but some tribes of natives enslaving others. The natives’ physiology and culture turn out to be more complex and advanced than Arabella initially realized, and she and others come to appreciate and even need the Venusians. Captain Singh is a paragon ― Arabella thinks of him as “the most intelligent, the bravest, and the most honorable” man she’s ever known ― but their relationship feels a little distant. That may be a deliberate function of Levine’s nod to Regency era manners in the style of writing and the proper behavior of … well, at least some of the characters. Levine effectively captures many of the mannerisms of the Regency era, while giving the story its distinctive retro SF spin. But he’s able to combine that with a more modern, enlightened point of view towards colonialism, slavery and sexism. Arabella and the Battle of Venus is both enlightening and a gripping adventure! Published July 18, 2017. 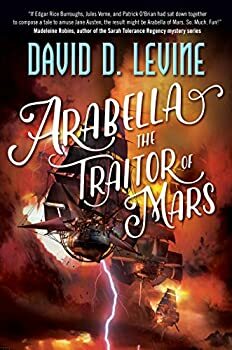 The thrilling adventures of Arabella Ashby continue in Arabella and the Battle of Venus, the second book in Hugo-winning author David D. Levine’s swashbuckling sci-fi, alternate history series! Arabella’s wedding plans to marry Captain Singh of the Honorable Mars Trading Company are interrupted when her fiancé is captured by the French and sent to a prisoner-of-war camp on swampy Venus. Now, Arabella must find passage to an enemy-controlled planet in the middle of a war, bribe or fight her way past vicious guards, and rescue her Captain. To do this she must enlist the help of the dashing privateer, Daniel Fox of the Touchstone and build her own clockwork navigational automaton in order to get to Venus before the dread French general, Joseph Fouché, the Executioner of Lyon. Once on Venus, Arabella, Singh, and Fox soon discover that Napoleon has designed a secret weapon, one that could subjugate the entire galaxy if they can’t discover a way to stop Fouché, and the entire French army, from completing their emperor’s mandate.